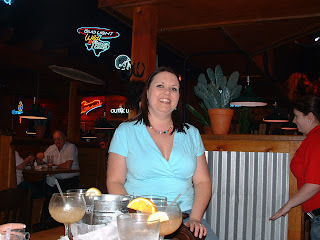 Well I just got back from my birthday dinner out with the girls and I thought I would post the pics of our fabulous time! We had a great meal, LOTS of laughs and of course alcoholic beverages! LOL These are all my all-time favorite people and also my stamping buddies! These great girls got me the most amazing birthday gift - a day at the local spa! I almost fell over - what an awesome gift! I can't wait to use it! 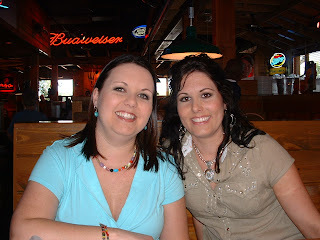 Me and My Sister Kimberly! 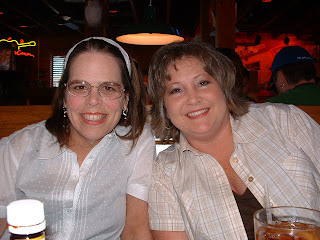 My Aunt Sharon and the Bestie Robyn! Me and the Best Friend Robyn! 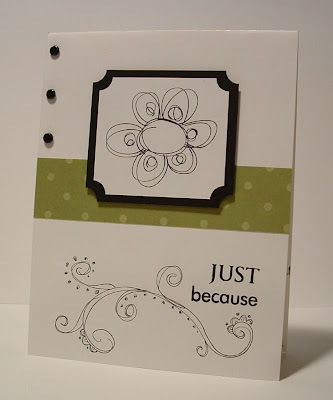 Yep, it's another one of those adorable images/sentiments from Hambo Stamps! 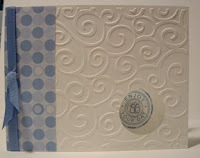 I am so excited to be a part of their design team - all the stamps I have received to work with ROCK! 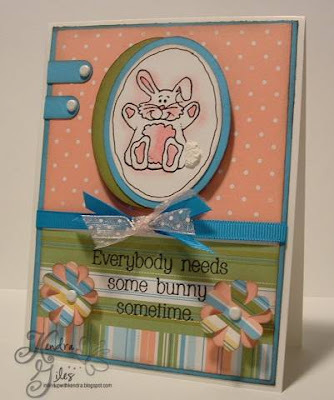 I had so much fun coloring this little bunny - this is going to be my easter card! I won't be drawing for the blog candy until this evening, so you still have time to enter - it's a random draw, so everybody has a chance to win! Tomorrow is my 36th birthday and I don't really know that I am super excited about it - where has the time gone? I mean I will enjoy going out with all my stamping girlfriends to celebrate at Texas Roadhouse (mmmm steaks and drinks!!!!) - but I am one year older and I'm not sure how I feel about that yet. I have been waiting for days to make this announcement, but have had to wait until I had the green light from Monica - well I just got the green light! I am the proud new member of the Hambo Stamps Design Team! Their stamps are just fabulous! 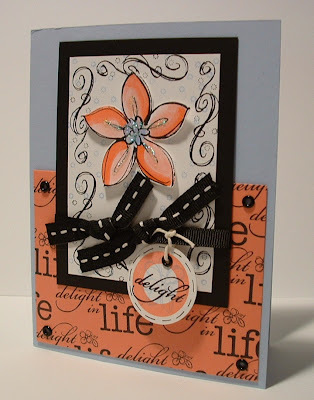 I will get to be working alongside some really great stamping talent! The Design Team will consist of: Myself, Cindy Brockes, Asela Hopkins and Isabelle Mung. 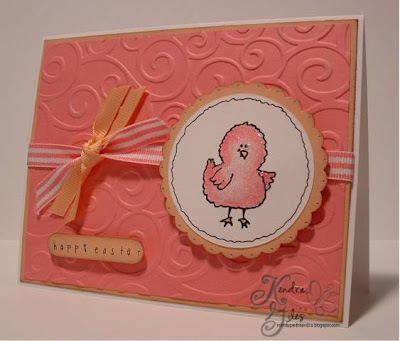 This cute little chick (I like to call her a peep lol) is one of their adorable stamped images - I had so much fun with this one! 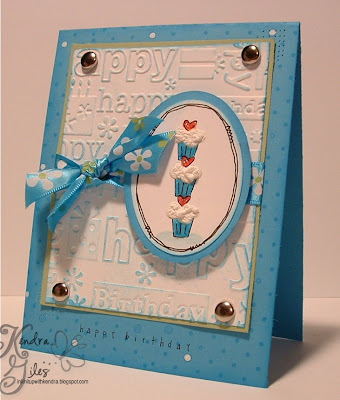 I will be posting cards here on my blog from time to time that I have designed using their stamps - this is gonna be a fun ride! 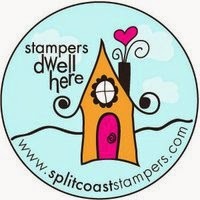 Be sure and go check out their website and get yourself some of those yummy stamps! (yes, I am an enabler and proud of it lol)! 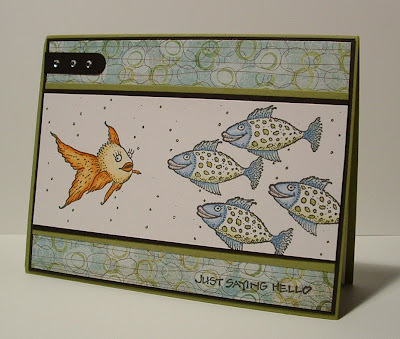 Monica at hambostamps.com also has a blog - check it out here! I have an AMAZING new blog banner that was created by a really talented and super sweet lady by the name of Sam Carnathan. 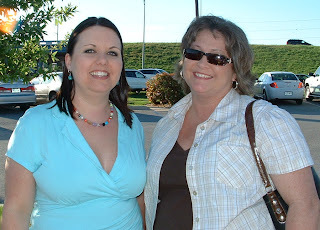 She was a real joy to work with over the last two months while she was creating a custom made banner for my blog. This banner is totally rockin' and I love it! 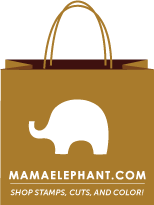 If you would like a custom made banner check out Sam' website and give her a shout - she works with you every step of the way to create exactly what you want - no payment due until the banner is completed and ready to be added to your blog. Thanks so much Sam for the great experience - my banner is really one of a kind! Big Blooms is 'da Bomb! 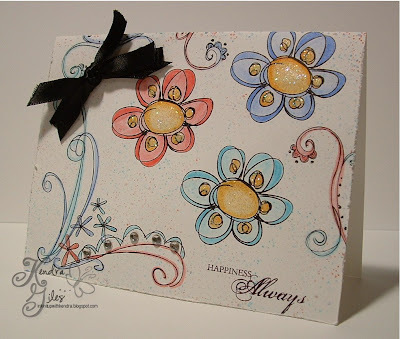 I spent the evening stamping with my bestie Robyn. I finally got her to sign up on Splitcoast and get herself a username. 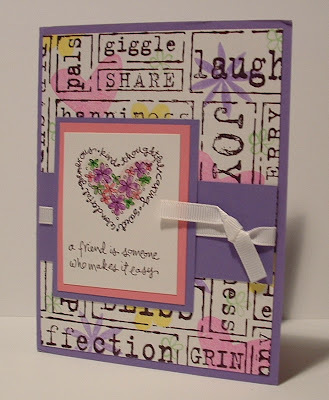 She has got some really cute cards and got a lot of them posted on her gallery for the first time tonight - if you are a member of SCS check out her gallery and make her feel welcome - show her some love! I have been showered with BLOGGER RAK'S! Wow, the last day or two have been amazing Happy Mail days! 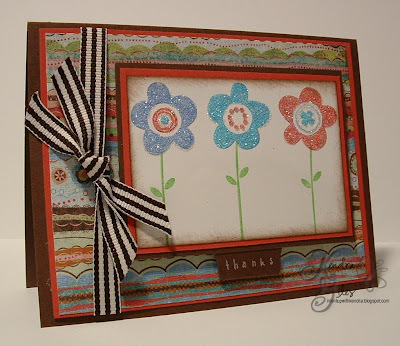 I have gotten about 6 or 7 amazing Blogger RAK cards just in the last two days..........here are a few of them - I will post the others tomorrow! 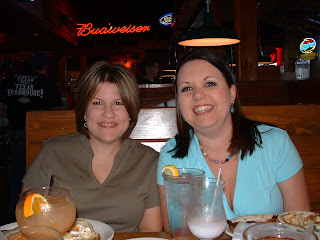 :) I truly have some really amazing blogger buddies - I am so lucky! 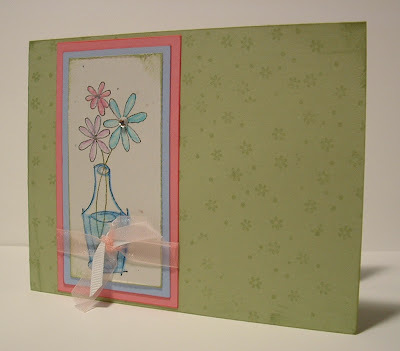 This totally adorable card came from another one of my wonderful friends - Asela Hopkins! This is not only a Blogger RAK, but it is also my birthday card from Asela (my birthday isn't until the 31st). I absolutely love the little kitty! 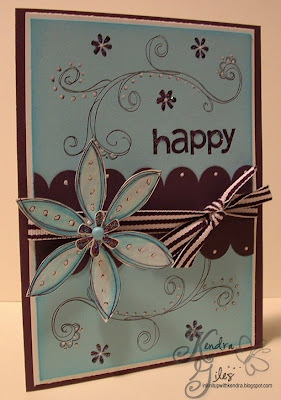 This is a great card Asela, I love it - thank you so much for sending it to me and wishing me a happy birthday! Check out Asela's blog if you haven't already! 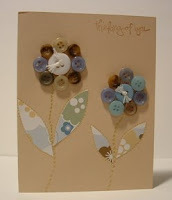 This lovely card is from another amazing blogger friend of mine, Kristine Breach! 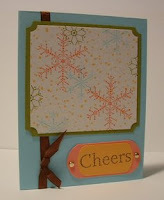 Kristine is also very talented (obvious from looking at the card). She has a heart of gold and is an absolute joy to get to talk to. 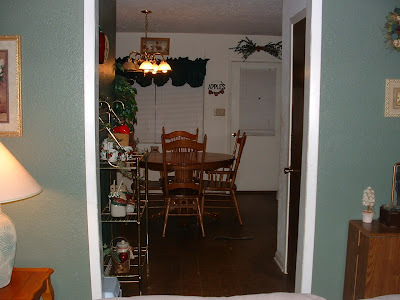 Check out Kristine's blog and see what I am talking about. 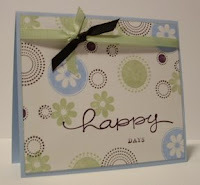 Kristine thank you so much for this card - it is sooooo cute! 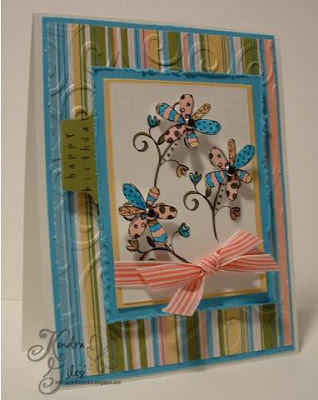 I loved that cuttlebug background so much I just ordered one for myself and it should be here anyday! My Doodle This set came today when the UPS man delivered my huge box of goodies! I have been waiting a while to get to play with this set. I decided to challenge myself to do a one-layer card - those are really hard for me to do because I have a layer addiction. 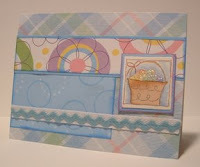 *wink* I watercolored everything with my blender pen using Taken with Teal, Ballet Blue, Marigold Morning and Rose Red. I added some rhinestone bling to the bottom of the card and everything else I covered with Stardust Stickles - it is so sparkly IRL. 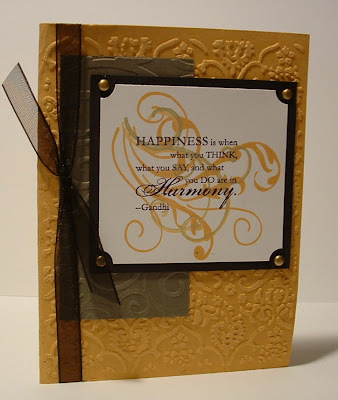 This card turned out beautiful! 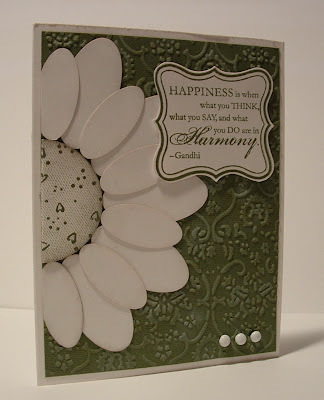 The sentiment is from the Happy Harmony set. 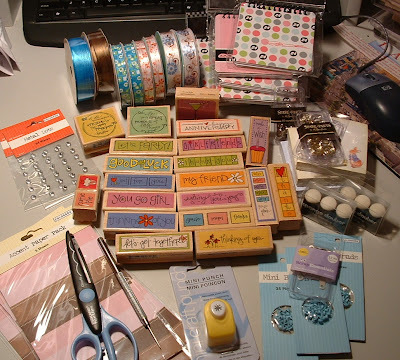 I seriously have got to clean off my stamping space, it is horrific! I will do that this afternoon so I can sit down and play with some of my new goodies! This is one of the cute little Michael's dollar stamps I got this past weekend - it is so cute! I just had to mask them so they look like they are stacked. I used Tempting Turqoise and Certainly celery - the ribbon is just to die for - it is from Michael's - and comes on a cute wooden bobbin. I bought a couple of those! 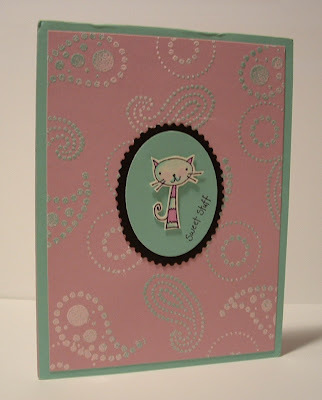 For the background I used the background stamp from Polka Dots and Paisley then colored in a few of the circles with my white gel pen. 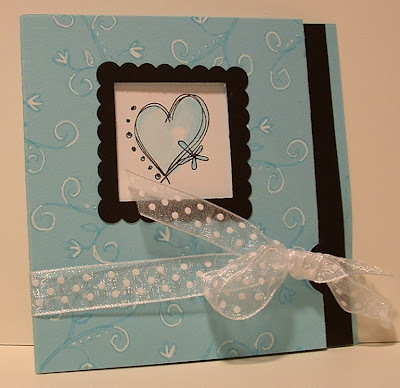 The layered background is of course done with my cuttlebug, then I sponged on some tempting turquoise. 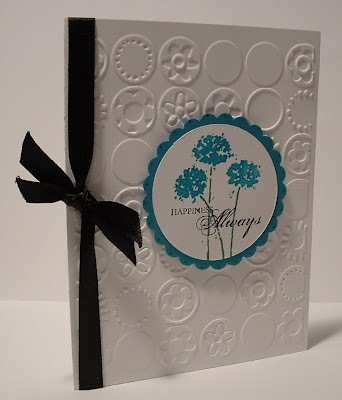 I cut the ovals using my creative memories oval cutter and mat - I have had the circles and ovals for several years and found they work great for my card creations. I doodled! I doodled around the edge of the oval and believe it or not it actually came out like I wanted it to. *wink* I don't doodle very much because I don't think I am that great at it, but maybe practice makes perfect. The brads are the jumbo brads from Hobby Lobby and the sentiment at the bottom are my karen foster snap stamps. 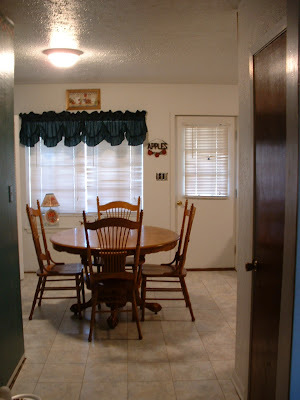 Kitchen Still Under Construction! 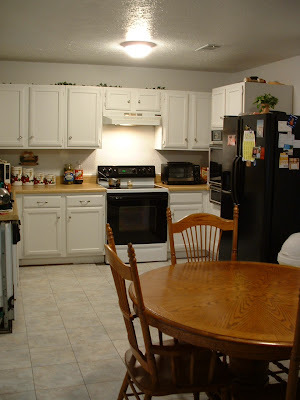 Well I have been MIA now for a couple of days, but that is only because for some stupid reason I decided that my kitchen needed to be renovated!!! I have been working tirelessly for the last several days and I am hoping to see an end in sight soon! I am now trying to finish laying the flooring and getting everything put back where it goes. 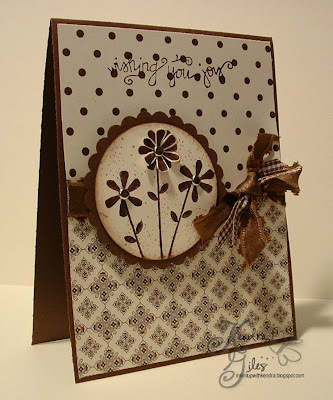 My body is aching and I am missing my stamping time. Don't fret, as soon as I get this job completed I will be back with some great new creations! Hugz!